[toc]There are many methods online that can add an extra income stream to your bank account and help you earn an extra or full-time income for you and your family. One of the best and most promising methods is by completing online tasks for money. I am a member to one of the oldest (7 years old), most trusted get paid to complete tasks websites for 5 years now and I always get paid in time for my work and efforts. Where to find online tasks to complete? How Much Money ca you make with online tasks? A Step-by-Step Tutorial on how to get started completing online tasks for money. Tips and Tricks to Maximize your earnings with online tasks. Pros & Cons of completing cash tasks online. Online Tasks are like online mini jobs that require human intelligence to be completed. Computers and other artificial intelligence bots cannot do this type of work. These tasks are created by organizations and big companies from around the world like Search Engines, Validation services, Research firms, Companies who want to spy their Competitors, Federal agencies, Marketers, Non profit organizations and much more. These organizations have understood that it is very unprofitable for them to pay their own employees to do this kind of Work. Sometimes these tasks are literally thousands and they have to be completed in days. That is why they are outsourcing the process to companies – like Clixsense – that have members that are willing to complete them. If you are wondering what kind of work you are going to be completing then take a look at the screenshot below. To find a websites login url. To validate an article’s author. and other similar online tasks that are easy and sometimes fan to complete. These online tasks – as you can see in the screenshot above – usually come in thousands so you can rest assure that you will always have available tasks to complete. For each task you complete you will get paid from $0.01 up to $0.10. Where to Find Paid Tasks Online to Complete? 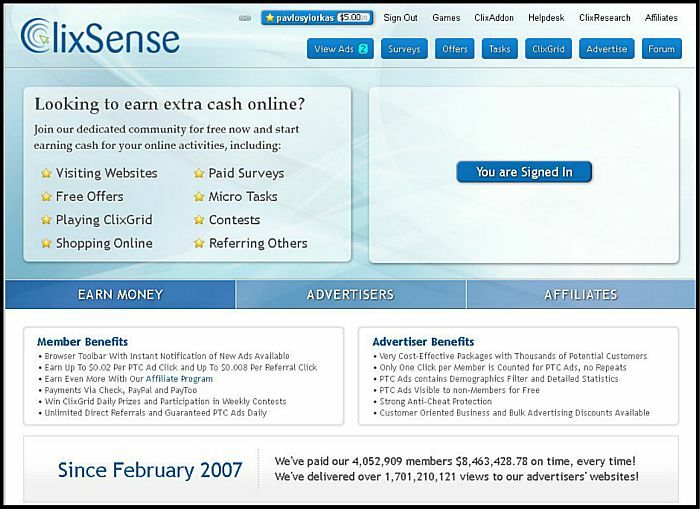 To earn money online by completing tasks you just have to join a Free Website called Clixsense. There are other websites like Clixsense that offer to its users the ability to complete tasks as well. The questions that arise though are many.. Some of them are..
How much time will this new website will last? Are they going to pay you on time, every time? Do these websites have any proofs of satisfied users? How long are they operating in the online tasks for money field? Well, if you don’t want to join an online tasks website and be afraid of not paying you or shutting its doors one day, then you can safely join Clixsense and leave all worries behind. How Much Money Can You Make With Online tasks? Although completing online tasks for money won’t get your rich you can be making up to $889.20 per month or more. Of course in this type of business, the harder your work the more money you are going to make. I have collected some screenshots from Clixsense’s website and forum that will help you understand how much money you can be making every month if you complete tasks for money. The First screenshot is from the page where tasks are listed. At the end of the page Clixsense has some counters that show which users completed the most tasks in 24 hours, in 7 days and in 30 days. Note that the first task worker completed 988 tasks in the last 24hours. If we multiply $29.64 X 30 days then this guy can make up to $889.20 in a single month. Can you use an extra $889.20 per month in your household? The next screenshots are taken from Clixsense’s forum. You can find many success stories there from people who make money doing tasks online. As I wrote earlier before, the amount of money you will be earning depends on how hard you are willing to work. 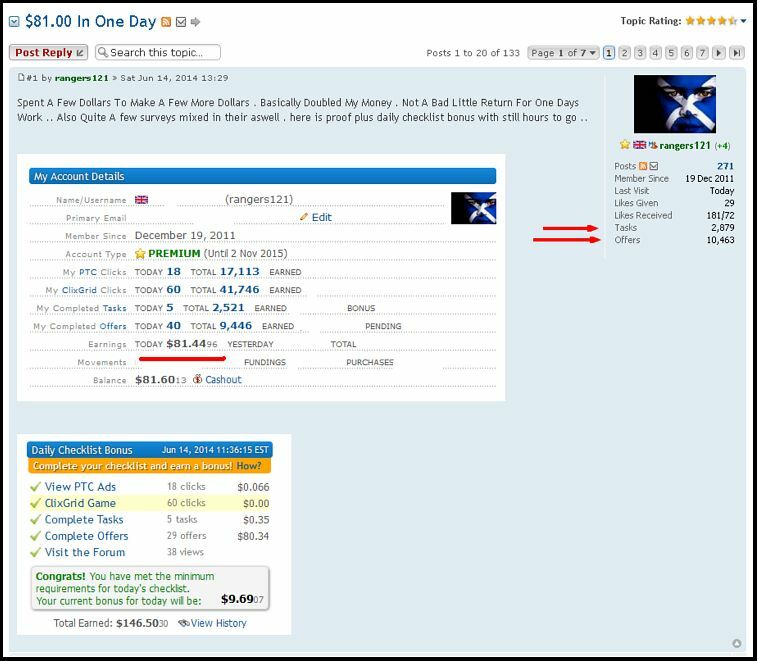 In the next screenshot taken from Clixsense’s forum, we can see a guy who earned $22 in a single day by completing online tasks. In this screenshot this user totally nailed it ! He earned $81 in a single day completing online tasks for money. Isn’t that incredible or what? By Going on Clixsense’s forum you can find many success stories and payment proofs uploaded by its members. Earn money online by completing tasks can make you up to $889.20 per month, always depending how hard you are willing to work. There are people who are OK earning an extra $300 per month and others who are OK just by earning $100. Step #1: First you need to create an account on Clixsense. The Clixaddon is a browser plugin that you must install to your browser. It is a very important piece of tool because it will notify you every time new tasks are available, as you surf other websites. Once a new task is available the Clixaddon™ will notify you about it. This way, you don’t need to visit Clixsense every ten minutes to check if new tasks are available. The link to download the plugin is on the top menu. Step #3: After you install the Clixaddon™ just visit your account and click on the tasks button right under the Clixaddon™ link. You will be redirected to the tasks page. On Clixsense there are 3 levels of tasks workers. When you sign up for the first time you will be a task worker level 1. You will be able to complete only tasks that have the blue level 1 badge next to them. When you complete your first 100 tasks you will become a level 2 task worker getting even more tasks with higher payments.You will be able to complete only tasks that have the blue level 1 badge and the green level 2 badge next to them. After you complete another 50 tasks the third level will be available to you with even more tasks and higher payments. You will be able to complete tasks that have the blue level 1 badge and the green level 2 badge and the orange level 3 badge next to them. Have you noticed that as the level get’s higher the more earnings you will be paid per task? If you want to maximize your earnings with tasks online, Clixsense offers an affiliate program which you can leverage to earn even more money from it. Start promoting Clixsene and this Free Money Making Opportunity through forums, free classified ads and traffic exchange programs (such as TrafficSwarm, TrafficSwirl, EasyHits4u) and earn 10% if you are a premium member and 5% for standard members from the earning of your referrals. If you have 10 referrals each of them earning $300 per month and you are a premium member(10% ), these are extra $300 for you every month without lifting a finger. I always like to summarize the pros and the cons when I talk about making money online methods. So here are the pros and cons of paid tasks online. Free To Start. No Investment Needed. Simple & Easy Money Making Method. Company Is online for 7 years. Trusted, Paying Always on Time. No restrictions on the amount of tasks and money you can earn. The more you work, the more you earn. Referral Program available to increase your earnings. Not all levels are available from the beginning. Completing Online tasks for money is a very good opportunity for making an extra income for you and your family. If you or your wife are unemployed and you have nothing to do, then maybe devoting 10 – 12 hours per day working from home will help you solve some of your financial problems. Also if you have a laptop you can always go to the nearest café where they have a wireless access point and create a second account (You cannot create 2 accounts from the same Ip address). 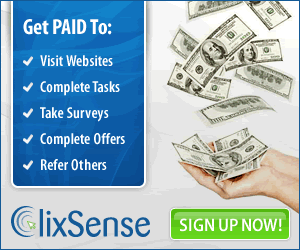 This way both of you can complete tasks and earn money from Clixsense. If you have any questions about Clixsense or complete tasks for money online, just drop a comment and I will get back to you as soon as possible. Also if you liked this post, then feel free to share it with your loved ones. I’m sure they will appreciate you sharing this post with them. I have been working in Clixsense for 2 months. Now if I want to follow the path shown by you I need to have another I P Address. Now please inform me whether it will be wise to do that or not. I’m so honored for you to want to join my team. Unfortunately, I can’t help you with that.. I don’t know if Clixsense will detect yyour ip change and ban you for ever from their system. You should probably stay with your current account and work with tasks. YOu can register to the newsletter if you would like to receive more articles,tips and tricks from Clixsense, the ptc industry and make money online. I’ll be happy to see you as my subscriber. Hi, I’m so glad you joined in and took the next step on earning an extra income. As I wrote in the article above, you have to complete a number of level 1 tasks before level 2 and level 3 tasks ”unlock”. When level 2 and level 3 tasks unlock, you will get an endless amount of tasks to complete. 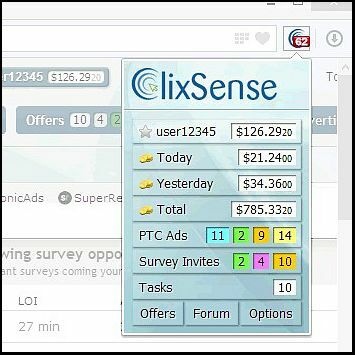 To make sure you never miss available tasks again, download the Clixaddon® – Clixsense’s browser plugin that notifies you of new tasks and ads without being on Clixsense. Ummm.. Have you read the article? It’s very detailed.. I want to change my email on clix sense. It is possible or not? Unfortunately you can’t. Why don’t you try contact then and ask them. Hello! Sir. i would like only to ask if i can be part of clixsense even though i’m from the Philippines? if yes! How can i receive my wage or earnings in clixsense if I don’t have a bank account? am i required to open a bank account? Yes, you need to have a bank account. You can request payment via Payoneer.